As you can see, my bike is not exactly standard anymore, and the problem I now face is getting a good quote for the bike. Don't want to risk losing out in the event of a claim? Don't like hiding your mods? I have now found a good company that specialises in modified and standard bikes. The way they work is they request a list of all the modifications and parts fitted. You receive a very simple Q&A sheet to fill in, and you get the chance to list every part and cost you have spent on the bike. Then you need to supply at least 3 photos showing the condition / parts fitted. A price is agreed for the bike and, if they are happy with the details and price, they will give you a price on the cover you require. All of the details are agreed over the phone, like you would with any other insurance company, and you only get the paper work side when you take out the insurance. My bike first modified bike was insured with an agreed value of £5000, for only £140 for fully comprehensive cover! 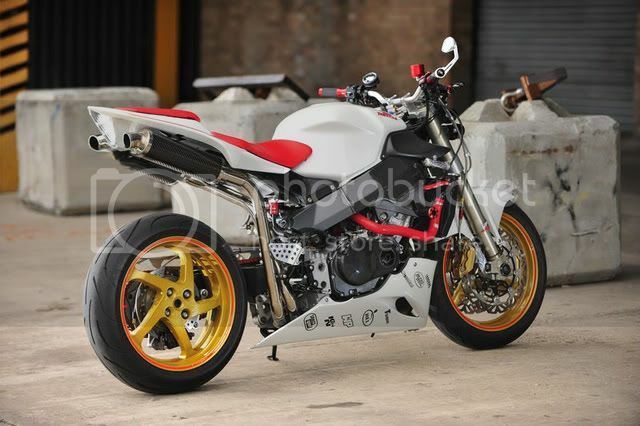 and my second bike (above) is insured for £11,000 for only £285 fully comp! The only thing they request is the bike must be secured with a Thatcham approved lock when not in use. You can buy those here! We have had many customers take advantage of this cover and, with this new web site, we can pass on the results. If you have used this service and had a good quote, send us the details and a photo too. Click on the image below for a quick quote. Even if your bike is standard, they are good....... "Get a FREE Quote"